Like a multi–ethnic gathering of friends, this seven member band has created a sound that evokes the early days of Latin Rock (Santana, War, etc. ), while adding their own blend of Funk grooves. 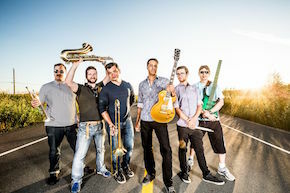 Lead by Nicaraguan frontman German Cantillo the band has an addictive combination of Nuyorican Boogaloo, West Coast Funk and the ever present Cuban grooves engulfing the stage with monstrous horns and bass, funky breaks with furious lyrics in English and Spanish. In 2006, Santa Lucia released their second full length album, "The Streets / Las Calles" with legendary producer Larry Anschell (Nickelback, Pearl Jam) from Turtle Recording Studios in White Rock, BC Canada. Santa Lucia successfully supported "The Streets / Las Calles" with countless West Coast dates and major open air festivals including; Vancouver International Jazz Festival, Vancouver Dragon Boat Festival, as well as many out of town festivals including The Ness Creek Music Festival in Saskatchewan, Folk on the Rocks Festival in Yellowknife NWT, Victoria Jazz Festival, Edge of the World. 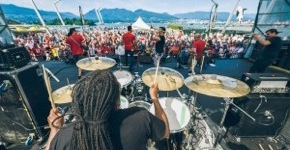 Because of their great appeal and versatility of their music they are welcomed in nearly every kind of festival such as Salmon Arm Blues & Roots Festival, Victoria Ska Fest, Vancouver Dragon Boast Fest to Taste of Fernie and Okanagan Winery shows series at Tinhorn Creek. Along with festivals they are also invited to perform various corporate events including the Diabetes society of Victoria, CBC French Alliance Society and Fundraisers for Canadian Veterans at Billy Bishop Legion. Such a contrast from playing at Jazz Cellar club in Vancouver to rock clubs in Western Canada and the US. opening for many USA and International touring acts such as Ozomatli, Yerba Buena, Los Mococos, The Skatalites, Maxi Priest, The Cat Empire, Los Lobos, Polyrythmics and Israel’s Hadag Nahash at the annual Jewish Chutzpa! festival. CBC Radio Canada gave the single "Lupita" heavy rotation, with the band performing a show at CBC studios broadcasting the show live across Canada hosted by one of Canada’s best known news personalities Gloria Makarenko and "On the Coast" radio host Prya Ramu. 2011 Santa Lucia released their third full length album "Suppressed Anthems" a blend of horn driven music anthems with a social conscience, Unique Latin sensibilities with plenty of rock, a shot of salsa, a shed–load of funk, and some high–speed Nicaraguan cumbia…" Latin revolutionary sloganeering, global politics and clenched–fist leftist anthems all bounce over the bands leftist grooves, spreading again its unique brand of rock all over the west coast.